Conservatives like to say that taxes are theft. In fact it is tax cuts that are theft because they break a long-standing contract. The American Social Contract: We, the People built our democracy and the empowerment and protections it bestows. We built the infrastructure, schools and all of the public structures, laws, courts, monetary system, etc. that enable enterprise to prosper. That prosperity is the bounty of our democracy and by contract it is supposed to be shared and reinvested. That is the contract. Our system enables some people to become wealthy but all of us are supposed to benefit from this system. Why else would We, the People have set up this system, if not for the benefit of We, the People? 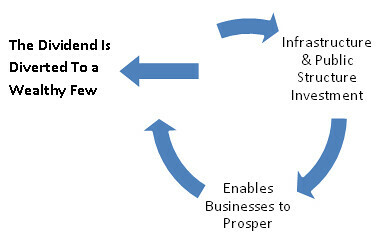 A beneficial cycle: We invest in infrastructure and public structures that create the conditions for enterprise to form and prosper. We prepare the ground for business to thrive. 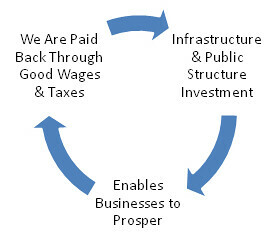 When enterprise prospers we share the bounty, with good wages and benefits for the people who work in the businesses and taxes that provide for the general welfare and for reinvestment in the infrastructure and public structures that keep the system going. We fought hard to develop this system and it worked for us. We, the People fought and built our government to empower and protect us providing social services for the general welfare. We, through our government built up infrastructure and public structures like courts, laws, schools, roads, bridges. That investment creates the conditions that enable commerce to prosper – the bounty of democracy. In return we ask those who benefit most from the enterprise we enabled to share the return on our investment with all of us – through good wages, benefits and taxes. Since the Reagan Revolution with its tax cuts for the rich, its anti-government policies, and its deregulation of the big corporations our democracy is increasingly defunded (and that was the plan), infrastructure is crumbling, our schools are falling behind, factories and supply chains are being dismantled, those still at work are working longer hours for fewer benefits and falling wages, our pensions are gone, wealth and income are increasing concentrating at the very top, our country is declining. This is the Reagan Revolution home to roost: the social contract is broken. Instead of providing good wages and benefits and paying taxes to provide for the general welfare and reinvestment in infrastructure and public structures, the bounty of our democracy is being diverted to a wealthy few. We, the People built this country’s prosperity and this built wealth. We reinvested that wealth, building the world’s most competitive economy. Now a few people are gaming the system and breaking the formula, taking for themselves vast riches, leaving the rest of us to clean up the mess. We must recognize and understand these tax cuts for what they are. They are a broken contract. These tax cuts for the wealthy are theft. And we must recognize the Reagan Revolution for what it has cost us. Our democracy has been corrupted and our political system has been captured. A wealthy few are taking all of the benefits of our efforts for themselves. The lack of investment in infrastructure, courts, schools and other public structures is making our country less competitive in the world. The Reagan Revolution is stealing our future. Update: see Tax Cuts Are Theft: An Amplification by Sara Robinson.